The T-H3S is well suited for residential/ commercial applications such as small restaurants and beauty salons. Complies with Ultra-Low NOx regulations. Utilizing commerical grade copper alloy for the heat exchanger tubing, the T-H3S is also suitable for heavier residential usages such as space heating or domestic recirculation systems. Remote control included as a standard feature on Outdoor models. The T-H3S supplies hot water to domestic hot water systems (directly or indirectly) which can be used with storage tanks, recirculation systems, hydronic heating systems, radiant floor systems, and/or domestic & heating applications. 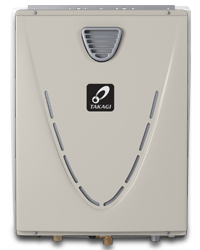 The T-H3S is a high efficient, condensing, tankless water heater perfect for residential applications. The T-H3S can produce enough hot water for three bathrooms in warmer climates or two baths in colder climates.